ESA's 2009 global land cover map has been released and is now available to the public online from the 'GlobCover' website. 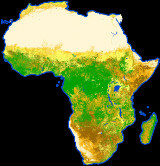 GlobCover 2009 proves the sharpest possible global land cover map can be created within a year. 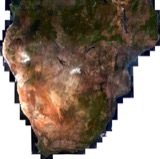 The map was produced using 12 months of data from Envisat's Medium Resolution Imaging Spectrometer at a resolution of 300 m.
ESA and Belgium's UniversitÃ© catholique de Louvain created the map using software developed by Medias France and Germany's Brockmann Consult on data collected from 1 January to 31 December 2009. GlobCover 2009 was generated within a year of acquiring the final satellite data. The map's legend uses the UN Food and Agriculture Organisation's Land Cover Classification System.